This very much enters the realm of medically justified abortion. Of course there are issues of properly determining real risk and actual microcephaly. Because we do have modern techniques we no longer have the option of taking a failed birth child out onto a hillside to allow death by exposure. Unfortunately that never meant we had the ability to prevent the situation in which this was the solution. Abortion is our modern solution and it has the benefit of been private. Babies will be conceived who have no possibility of living a full human life. As it is we err on the side of caution and sustain a small population of the mildly retarded usually well engaged and perhaps even happy. All well and good. It is those who have no hope at all that are so troublesome. They are very much the walking dead. If that can be identified early then abortion is truly a blessing for all. Identification is the real problem here. Just when do we know that the fetus is affected? These are terrible decisions and abortion has been applied to huge numbers healthy viable fetuses so the choice is very much available even if no proof exists yet. 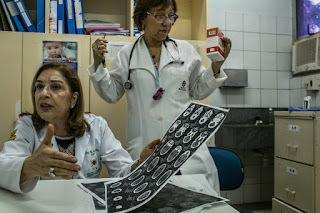 RECIFE, Brazil — The surging medical reports of babies being born with unusually small heads during the Zika epidemic in Brazil are igniting a fierce debate over the country’s abortion laws, which make the procedure illegal under most circumstances. Legal scholars in Brasília, the capital, are preparing a case to go before Brazil’s highest court, saying pregnant women should be permitted to have abortions when their fetuses are found to have abnormally small heads, a condition known as microcephaly that Brazilian researchers say is linked to the virus. A judge in central Brazil has taken the rare step of publicly proclaiming that he will allow women to have legal abortions in cases of microcephaly, preparing the way for a fight over the issue in parts of the country’s labyrinthine legal system. And here in Recife, the Brazilian city hit hardest by the increase in microcephaly and the brain damage that often comes with it, abortion rights activists are seizing on the crisis to counter conservative lawmakers who have long wanted to make Brazil’s abortion laws — already among the most stringent in Latin America — more restrictive. How dangerous is the virus and who is most at risk? Some Brazilian doctors are already encountering pregnant women seeking abortions because of the spike in microcephaly cases. Dr. Artur Timerman, an infectious-disease specialist in São Paulo, said that two patients had spoken with him in recent weeks about ending their pregnancies because they had tested positive for the Zika virus. The debate over whether women should be allowed to have abortions in microcephaly cases could reverberate across the region. The outbreak in the Western Hemisphere is believed to have begun in Brazil, the country with the most Zika infections by far. But it has spread to more than 25 countries and territories in the Americas, some with abortion laws as restrictive as Brazil’s, if not more so.